Abbotsford? What the heck was I doing out there? And grabbing AYCE Japanese? Did I lose my mind? Well, I probably lost my mind some time ago, so we are well past that. However, the reason for being this far into the Fraser Valley was the result of attending the Christmas Show at the Tradex. 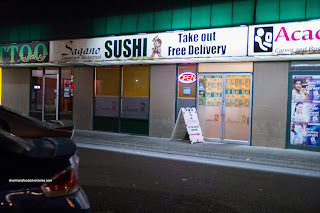 We made our way into town and decided to try Sagano, which was closed the last time we craved Japanese in Abbotsford (yes really...). And the AYCE came about because it was actually cheaper than ordering a la carte (and all of the items we wanted were on the AYCE menu including specialty rolls). So after nervously marking down my selections on the order sheet, we waited for our fate. 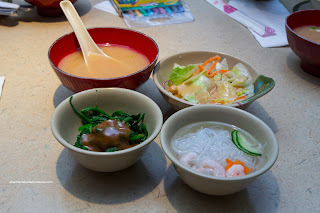 The first wave consisted of Miso Soup, Green Salad, Spinach Gomae and Ebi Sunomono. The gomae was decent with tender spinach topped by a light drizzle of sweet (with a touch of salt) sesame dressing. The sunomono featured chewy noodles with a balanced dressing. 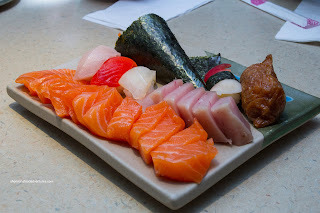 Next was the Sashimi consisting of salmon and tuna along with some Nigiri. Although not sliced particularly well, the sashimi was alright. With a nice sheen and smell, there was no overly mushy items nor fishiness. The sushi rice for the nigiri was on the firmer side and mild tasting. 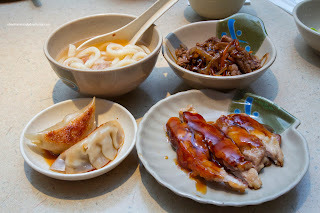 Next, we had the Chicken Udon, Beef & Chicken Teriyaki and Gyoza. The pieces of chicken in the udon was super moist while the udon was chewy. The soup was more like chicken broth than typical udon broth. Both teriyaki dishes were pretty typical of AYCE with a sweet glaze. The meats were moist though. 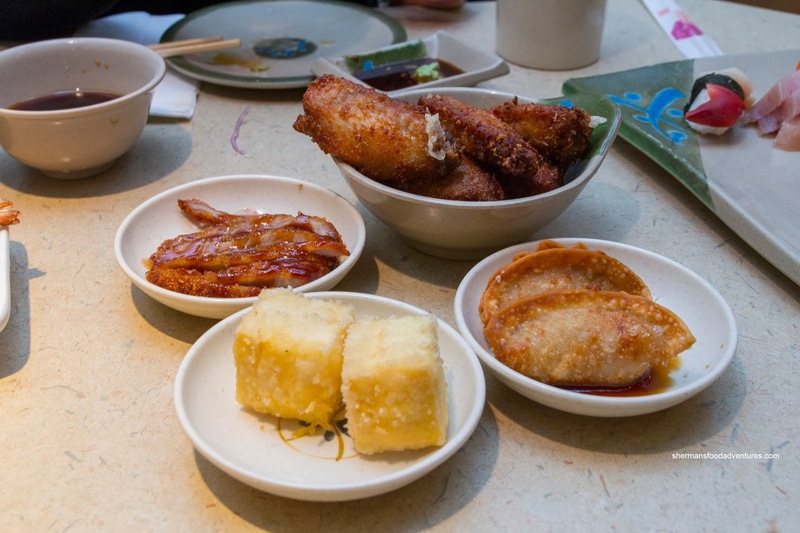 The same could be said about the gyoza as it was standard with a relatively thin skin and a pork & cabbage filling. 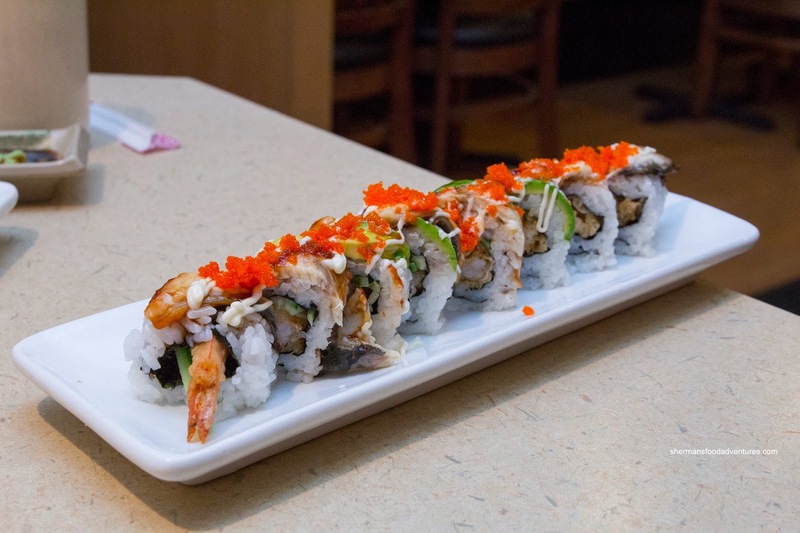 As mentioned, they had full versions of their specialty rolls on the AYCE menu and we got the Dragon Roll consisting of ebi tempura and cucumber with unagi, avocado, tobiko and mayo on the outside. Not a bad roll, but heavy on the rice. Moving along and thinking about the hockey game later on, we had the Tonkatsu, Chicken Karaage, Fried Gyoza and Agedashi Tofu. Not a huge fan of the tonkatsu as it was razor-thin while the wings were crispy and juicy. The fried gyoza was nothing out-of-the-ordinary whereas the agedashi tofu was pretty lonely without any dressing to go with it (it was crispy though). 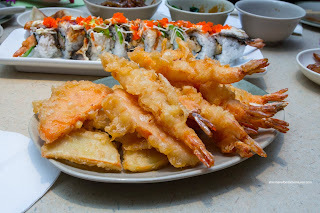 For the kiddies, they kept reminding us that the Tempura had not arrived yet. When it did, they attacked it like wild animals. Everything was cooked right while the batter was crunchy. We found it a bit greasy though. For no good reason, we got another specialty roll being the Canuck (possibly because the game was on the TV at the time?). 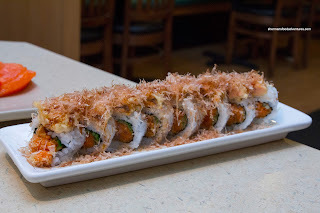 It was made up of spicy tuna on the inside with salmon tempura and bonito on the outside. Again, the amount of rice made the roll heavy and the slightly dry salmon didn't help matters. I much preferred the Dragon Roll. 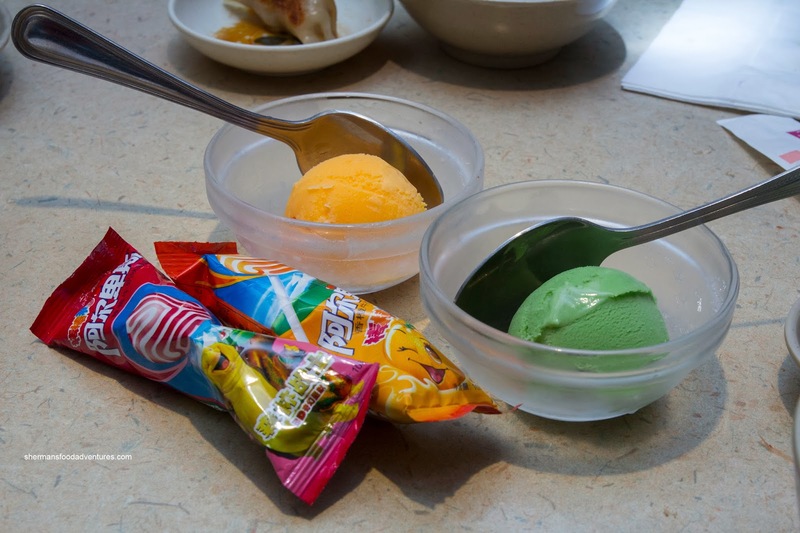 For dessert, we got Mango and Green Tea Ice Cream. The friendly owner-lady gave the kids some lollipops as well. 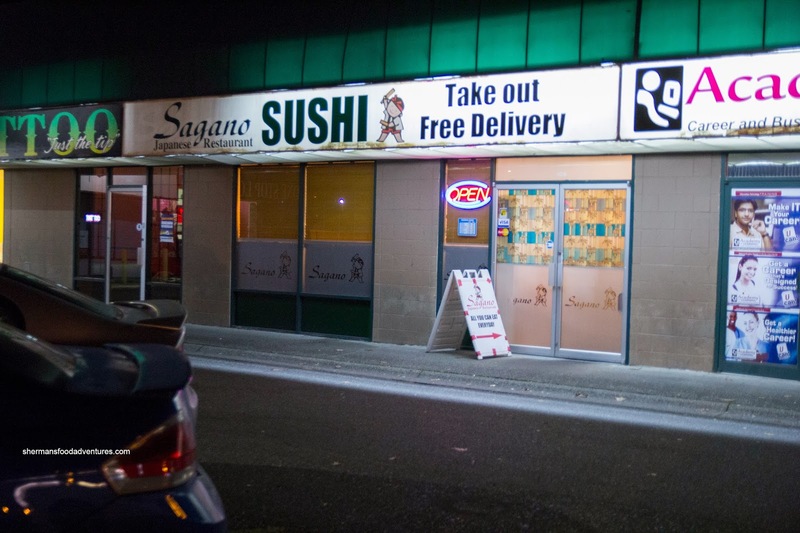 Hey, for Abbotsford, this was a solid AYCE complete with friendly service. Much better choice than places such as Sui Sha Ya.